WINDHOEK 19/11/2010 - African producers criticised Friday the Kimberley Process, tasked with stopping the flow of conflict diamonds, for reinstating a ban on Zimbabwe's Marange gems where abuses were reported. 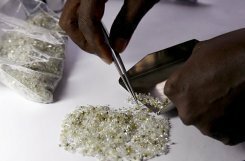 "The motives behind the attempt to block Zimbabwean diamonds are sinister," said African Diamond Producers Association executive secretary Edgar de Carvalho. "Zimbabwe cannot be held to ransom just because a minority of countries within the KP (Kimberley Process) continue to block consensus deliberately," he said in a statement. The Kimberley Process barred the sale of Marange diamonds in November 2009 following reports of human rights abuses by the army at the mine. A monitor appointed by the watchdog in July partially lifted the ban, saying Zimbabwe had ceased abuses by the military, which seized control of the Marange fields in late 2008 and forced out tens of thousands of small-scale miners. Zimbabwe held its first diamond sale in August. Kimberley Process chairman Boaz Hirsch said in a statement on Thursday that no agreement was reached on Zimbabwe's sale of Marange diamonds at a recent conference, therefore no trade should take place. Hirsch said consultations continued within the Kimberley Process to determine if Zimbabwe should be allowed to sell diamonds from the Marange fields. He called on KP members not purchase Marange diamonds outside the organisation's regulations. "As a consequence, no trade of Marange diamonds can currently take place under the Joint Work Plan until an agreement can be found," said Hirsch. The 18-member African Diamond Producers Association wants Hirsch to withdraw his statement. "The ADPA might also be forced to make a declaration that might have severe negative ramifications regarding the continued participation of its member states in the Kimberley Process," de Carvalho said. The association met in Namibia to discuss harmonisation of regulatory and fiscal legislation for African diamond-producing countries.